Today YouGov published their final seats per party forecast for election 2017, one of the Conservatives holding onto only 302 of their 331 seats, Labour surging to 269 and the SNP falling to 44 with only a flicker of life in the Lib Dems rising to just 12. For much of the election campaign YouGov followed the pollster herd by forecasting a Conservative landslide but then late May apparently decided F-this and went for broke by increasingly pumping out crazy poll expectations at the extreme opposite to that which they had been forecasting barely a few weeks earlier. As for real reason why YouGov switched from forecasting a Tory landslide to a hung parliament, one only needs to look at the mainstream media's subsequent feeding frenzy who have been literally gorging on YouGov's hung parliament forecasts that the mainstream media had been craving so that they could turn a boring BrExit election into a fever pitched too close to call headline grabbing papers selling election. Hence the media storm around YouGov's polls and forecasts. 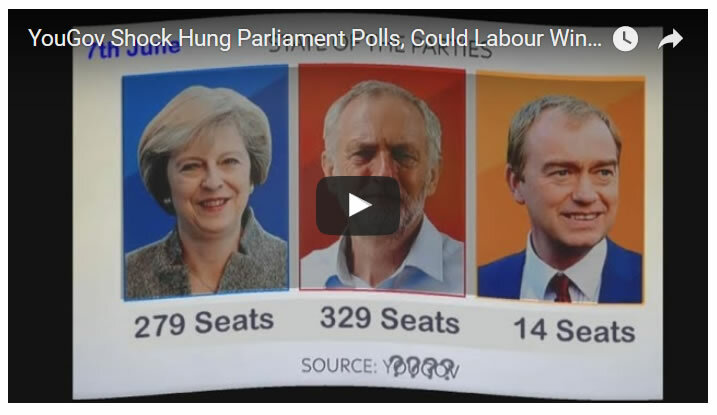 So the mainstream media is being fed with a continuous stream of attention grabbing headlines based on YouGov's forecasts, that now has the Tories seats tally falling to just 302 whilst Labour continues to rise like a phoenix now elevating to 269 seats, with the SNP on 44, and the Lib Dems trailing on 12. Do you understand what this implies ? Labour 269 + SNP 44 + Lib Dem 12 = 325. Yeah, that's right YouGov are forecasting that an unholy left / nationalists alliance will WIN the UK General Election 2017! 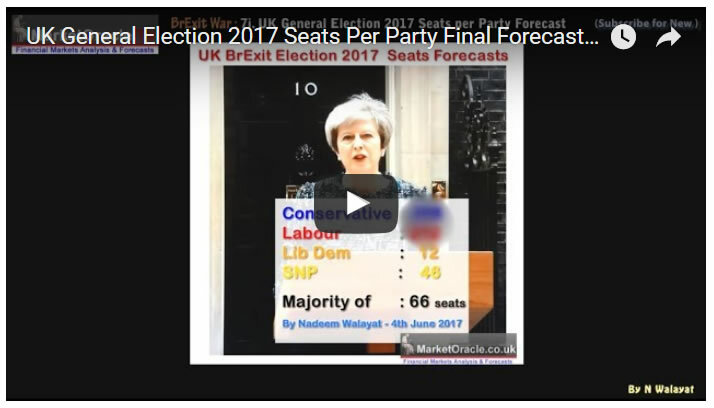 However, as for what is the most probable outcome of this UK general election then see the culmination of the sum of all of my election analysis of the past 6 weeks that forecasts a final seats per party forecast conclusion. Remembering that unlike YouGov I actually did correctly call the 2015 UK general election, EU referendum and Trump! Because my primary objective is always to arrive at that which is the most probable outcome so I can bet and win money on the result! 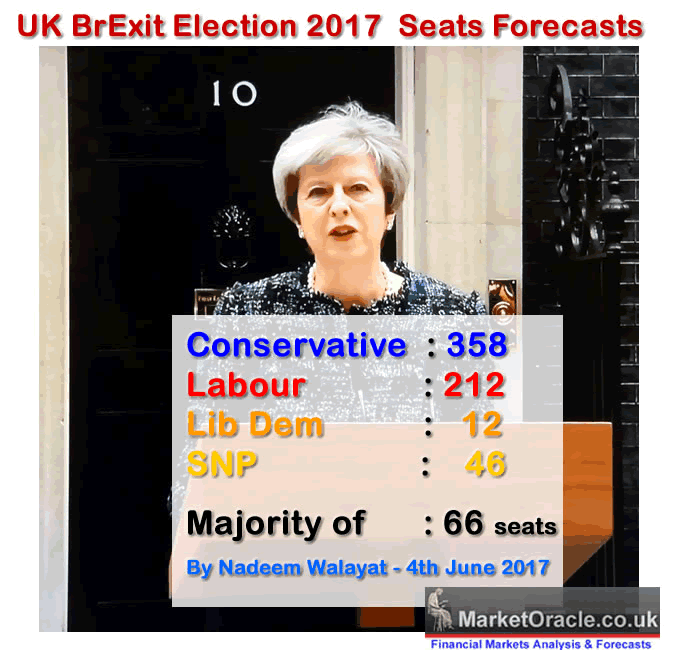 So in summary my UK General Election 2017 final forecast conclusion on the basis of the sum of my analysis of the past 6 weeks is for the Conservatives to win the election with a 66 seat majority by increasing their seats total from 331 to 358. I expect Labour to drop by 20 seats to 212 with the Lib Dems gaining 4 to 12, and I expect the Scottish nationalists to lose 10 seats by dropping from 56 to 46. What if my forecast proves inaccurate, what then could the next most probable outcome be? We'll whilst I had been creating the video I had the scene from Game of Thrones end of Season 6 playing in my mind, where Cersi Lanister is preparing to attend her trial at the Sept of Baelor, but when she does not turn up it slowly starts to dawn on Queen Marjorie that something is very seriously wrong, as Cersi Lanister has plotted to incinerate all of her enemies by blowing up the Sept of Baelor with dragon fire. Theresa May is Cersi Lanister! And so I would not be surprised if she really does blow up the Labour / SNP coalition hopes by winning a landslide election victory! Which would be at the extreme opposite of YouGov, and if that happens then what for the future of YouGov? How many elections can YouGov get wrong before people realise just how worthless YouGov polling and forecasts have been? And what IF YouGov get this election right? Well I could say that they got lucky, but the reality is a coin toss would have proved far more lucky then YouGov, so whilst they will make much media spin from getting this election right, the reality would be a coin toss would have proved more accurate than YouGov! Anyway we won't have to wait much longer for the actual election result. And do subscribe for my next video in which I will take a look at the betting markets to see if there are any opportunities out there as we count down to the results.